Campbell Cooper not only has an unusual first name, but also is an 18-year-old girl who believes she has no future. After being diagnosed more than seven years before with cancer, and having undergone many trials and treatments, Cam learns there is nothing else to be done for her. She cannot and does not allow herself any hope for a future. Cam was raised in Florida and lives with her mother, Alicia, and younger sister, Perry. Both her parents (her father now deceased) work at Disney World, and Cam also is employed in the land of enchantment and fantasy. Her one true friend, Lily, another cancer victim, whom she met at St. Jude’s Hospital, lives in North Carolina. Though they are at a distance from each other, they text and talk every day, sharing their fears and dreams in the special way only those who share an insidious disease can. Alicia learns of a mystical town called Promise, Maine, and the summer after Cam’s high school graduation decides to move there, hoping against hope for a miracle for Cam. Dismayed by her mother’s optimism, Cam cannot let herself believe in a cure; however, when they arrive in Promise, she finds things are indeed magical. Promise sports purple dandelions, amazing everlasting sunsets, and flamingos, which only survive in sub-tropical climates and not the frigid northeast. Cam meets a captivating young man named Asher, who also seems to turn up just when needed. Before heading to Maine, Cam and Lily conspire to make a “bucket list” of things they want to complete before death takes them. Knowing they are too young for a bucket list per say, they name theirs, the “Flamingo List.” As Cam crosses off each item on her list, she finds herself anticipating a miracle and hopes for a cure for her disease, realizing Promise is a magical place. Cam’s dry wit and lack of belief make a grim topic one the reader will ponder over, thinking about their own mortality as well as their place in life. Belief in oneself as well as belief in miracles is the author’s main premise. 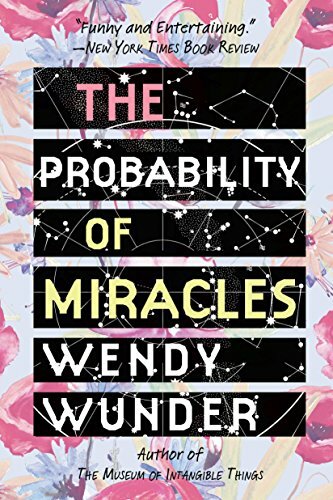 A profound read, The Probability of Miracles depicts the harsh realities of life coupled with the pain of maturing, giving the reader much food for thought.